M3 Investment Services' financial advisors offer a wide range of products and services to help meet your investment planning needs. They also provide comprehensive financial plans to ALL clients at no additional fee. Whether you are saving for retirement, preparing for college expenses or insuring your family's wealth, our advisors can help. Your M3 Investment Services financial professional can work with you to assess your investment objectives, time horizon and tolerance for risk. Your advisor can then help you set attainable goals, and develop and maintain a comprehensive investment program designed to help you reach them. Our advisors are independent, which means we aren't tied to any particular product. We can guide you through all of your family's financial needs. We work collaboratively with investors to help them make intelligent, informed decisions about their investments. Speak with us today about your options. Disclosure: An investment in a money market fund is neither insured nor guaranteed by the Federal Deposit Insurance Corporation or any other government agency. Yields will fluctuate, and although the fund seeks to preserve the value of your investment as $1.00 per share, it is possible to lose money by investing in the fund. 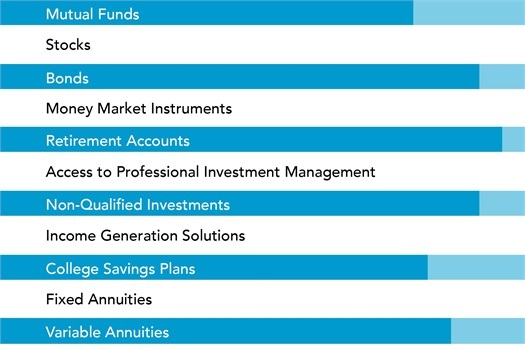 Before investing in a mutual fund or variable annuity, consider its investment objectives, risks, charges and expenses carefully. The prospectus for a mutual fund or the policy prospectus and prospectuses for the underlying investments of a variable annuity, which contain this and other information, can be obtained by contacting Legend Equities Corporation. Please read the prospectus or prospectuses carefully before you invest or send money.